This article is about the basketball player and coach. For other people with the same name, see Michael Cooper (disambiguation). The Atlanta Dream are a professional basketball team based in Atlanta, Georgia, playing in the Eastern Conference in the Women's National Basketball Association (WNBA). The team was founded before the 2008 WNBA season began. The team is owned by Dream Too LLC, which is composed of two Atlanta businesswomen: Mary Brock, and Kelly Loeffler. Like some other WNBA teams, the Dream is not affiliated with an NBA counterpart, even though the Dream share the market with the Atlanta Hawks. He attended Pasadena City College before transferring to the University of New Mexico. He played for the New Mexico Lobos for two seasons, 1976–78,  and was named first team All-Western Athletic Conference. In his senior season the Lobos won the WAC title, with Cooper averaging 16.3 points, 5.7 rebounds and 4.2 assists per game. Pasadena City College (PCC) is a public community college in Pasadena, California. The New Mexico Lobos men's basketball team represents the University of New Mexico, competing in the Mountain West Conference (MWC) in NCAA Division I. UNM established basketball as a varsity sport in 1899 and began competing with regional colleges after establishing an athletics department in 1920. At 6 ft 5 in (1.96 m), 174 lb (77 kg), the rail-thin Cooper known for his knee-high socks, played shooting guard, small forward, and point guard, although his defensive assignment was usually the other team's best shooter at the 2 or 3 position. 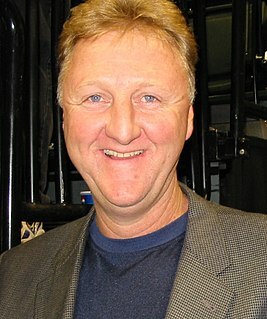 Larry Bird has said that Cooper was the best defender he faced. For his career, Cooper averaged 8.9 points, 4.2 assists, 3.2 rebounds, 1.2 steals, and 0.6 blocks per game. A popular player among Lakers fans, home crowds were known to chant, "Coooooooop" whenever he controlled the ball, and the Lakers sometimes ran an alley-oop play for him that was dubbed the "Coop-a-loop." Leaving the team after the 1989–90 season, he was ranked among the club's all-time top 10 in three-point field goals (428), games played (873), total minutes played (23,635), steals (1033), blocked shots (523), assists (3,666), defensive rebounds (2,028), offensive rebounds (741) and free throw percentage (.833). He then played for the 1990–91 season in Italy for Pallacanestro Virtus Roma in the Italian Serie A, averaging 15.8 points, 6.1 rebounds, 1.9 steals, 1.8 assists, and 0.3 blocks per game. 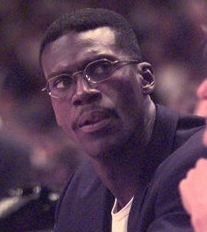 Following his playing career, he served as Special Assistant to Lakers' general manager Jerry West for three years before joining the Lakers' coaching staff in March 1994 under Magic Johnson, then with Del Harris from 1994–97. He became an assistant coach of the WNBA's Los Angeles Sparks in 1999, and helped the team reach the playoffs for the first time in franchise history, with a record of 20-12. He was named the Sparks' head coach in November 1999, and the Sparks' record quickly improved, as they finished 28-4 in their 2000 campaign. Cooper was named the WNBA Coach of the Year for his efforts. The Sparks followed with consecutive WNBA Championships in 2001 and 2002, but were denied a third straight WNBA title by losing to the Detroit Shock in 2003. After the Sacramento Monarchs ended the Sparks' run in the first round of the 2004 WNBA Playoffs, Cooper took a job as an assistant coach under Jeff Bzdelik with the Denver Nuggets. After 24 games, Bzedlik was fired, and Cooper was named the Nuggets' interim head coach. He remained interim head coach until George Karl was brought in to coach the team about a month later and served as a scout for the Nuggets the remainder of the season. Cooper was the head coach for the Albuquerque Thunderbirds for two years (2006–2007). In 2007, Cooper left the Thunderbirds after coaching them to the National Basketball Association Development League Championship in 2006. Cooper then returned to coaching in the WNBA as the head coach of the Los Angeles Sparks. In July 2014, Cooper was diagnosed with early stage tongue cancer. Cooper will have surgery at Winship Cancer Institute of Emory University in Atlanta, and a full recovery is expected. His contract was not renewed by Atlanta after an 11–22 season in 2017. In 2018, Cooper signed on to be the head coach for 3's Company of the Big3 League. Joseph Washington "Jellybean" Bryant is an American retired professional basketball player, current coach, and the father of former Los Angeles Lakers guard Kobe Bryant. Bryant was the head coach of the WNBA's Los Angeles Sparks from August 22, 2005 until April 4, 2007. He returned to that position after Jennifer Gillom was fired by the Los Angeles Sparks on July 10, 2011. Bryant has also coached in Italy, Japan and Thailand. Chamique Shaunta Holdsclaw is a former professional basketball player in the Women's National Basketball Association (WNBA) most recently under a contract with the San Antonio Silver Stars. She announced her retirement from the Los Angeles Sparks on June 11, 2007, though she eventually came out of retirement to play with the Atlanta Dream for the 2009 WNBA Season. Cynthia Lynne Cooper-Dyke is an American basketball coach and former player who has won championships in college, in the Olympics, and in the Women's National Basketball Association (WNBA). She is considered by many as one of the greatest women's basketball players ever. In 2011, she was voted by fans as one of the Top 15 players in WNBA history. Upon the league's formation, she played for the Houston Comets from 1997–2000, being named the Most Valuable Player of the WNBA Finals in all four seasons, and returned to play again in 2003. On April 11, 2013 she was introduced as the head coach for the University of Southern California women's basketball team. In her first season as head coach at USC, she led the Women of Troy to their first Pac-12 conference championship and consequently, their first NCAA tournament bid since 2006. After four seasons, she resigned from USC following the 2016–17 season. Lafayette "Fat" Lever is an American retired professional basketball player born in Pine Bluff, Arkansas who played in the National Basketball Association. He later served as the director of player development for the Sacramento Kings of the NBA. as well as a color analyst for Kings radio broadcasts. Orlando Vernada Woolridge was an American professional basketball player who played in the National Basketball Association (NBA) from 1981 to 1994. He was known for his scoring ability, especially on slam dunks. Larry Smith is a former American professional basketball player. A 6'8" forward/center from Alcorn State University, Smith spent 13 seasons (1980–1993) in the National Basketball Association (NBA), playing for the Golden State Warriors, Houston Rockets, and San Antonio Spurs. Smith received NBA All-Rookie Team Honors in 1981, and would become one of the best rebounders of the 1980s. He had career averages of 9.2 rebounds and 25.9 minutes per game. Paul William Westhead is an American basketball coach who most recently was the head coach of the University of Oregon women's team. 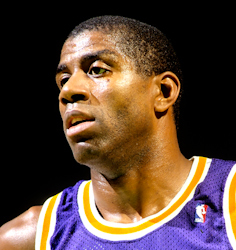 In his first year as an NBA head coach, he led a rookie Magic Johnson and the Los Angeles Lakers to the 1980 NBA Title. He has previously been a head coach for three National Basketball Association (NBA) teams and an assistant for four others, and has also coached in the National Collegiate Athletic Association (NCAA), Women's National Basketball Association (WNBA), American Basketball Association (ABA) and Japan Basketball League (JBL). He won titles in both the NBA and WNBA, and is also remembered as the coach of the Loyola Marymount University (LMU) men's basketball team during that school's era of greatest basketball glory. Westhead is known for an unorthodox, run-and-gun style called "The System." He attended Saint Joseph's University. This article lists all-time records achieved in the NBA regular season in major statistical categories recognized by the league, including those set by teams and individuals in a game, season, and career. The NBA also recognizes records from its original incarnation, the Basketball Association of America (BAA). Lindsey Marcie Harding is an American retired professional basketball player and assistant coach for the Philadelphia 76ers. Throughout her playing career, Harding played for the Minnesota Lynx, Washington Mystics, Atlanta Dream, Los Angeles Sparks, New York Liberty and Phoenix Mercury of the Women's National Basketball Association (WNBA) and has played overseas in Turkey and Russia. She was born in Mobile, Alabama, but grew up in Houston, Texas. The 2009–10 USC Trojans women's basketball team represent the University of Southern California in the 2009–10 NCAA Division I women's basketball season. 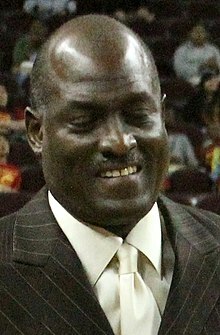 The Trojans are coached by Michael Cooper. The Trojans are a member of the Pacific-10 Conference and will attempt to win the NCAA championship. De'Anthony Melton is an American professional basketball player for the Phoenix Suns of the National Basketball Association (NBA). He was selected by the Houston Rockets in the second round of the 2018 NBA draft with the 46th pick, but was traded to Phoenix before his rookie season began. He played college basketball for the USC Trojans of the Pac-12 Conference, but did not play in the 2017–18 season due to the events relating to the 2017–18 NCAA Division I men's basketball corruption scandal. ↑ Cooper named women's basketball coach, Retrieved May 1, 2009. ↑ "Coach Bio". NBA.com/coachfile. Archived from the original on November 4, 2012. Retrieved July 12, 2008. ↑ Buerge, Daniel. (April 15, 2012). "Happy 55th Birthday Laker Legend Michael Cooper". Retrieved June 14, 2015. ↑ Hurt, Bob (May 13, 1984). "Injuries strengthen Lakers' bench". The Arizona Republic . p. Sports 1. ↑ Michael Cooper - Pasadena City pasadena.edu, July 12, 2008. ↑ 1978 Draft Archived 2008-06-26 at the Wayback Machine basketball-reference.com, Retrieved July 12, 2008. ↑ (February 6, 2002)Larry Bird Chat accessed October 5, 2008. ↑ Eded, Gordon (May 7, 1987). "MICHAEL COOPER: A LAKER DEEP THREAT : Three-Pointer Is Becoming an Arc of Triumph". Los Angeles Times. Archived from the original on October 16, 2011. ↑ "Nuggets off to 13-15 start". ESPN. Associated Press. December 29, 2004. Retrieved July 12, 2008. ↑ "Michael Cooper quits at USC". ESPN. Associated Press. March 13, 2013. Retrieved March 14, 2013. ↑ "Atlanta Dream Name Michael Cooper Head Coach". November 21, 2013. Archived from the original on March 11, 2014. Retrieved March 11, 2014.